For Open Heritage Day on 8 and 9 September 2018, historic buildings and sites across Germany will open their doors and invite people to take a stroll into the past. Deutsche Wohnen’s four UNESCO World Heritage sites are also taking part: on both days, the company will offer free tours through the Britz Horseshoe Estate, the Weisse Stadt, the Carl Legien Estate and the Siemensstadt Ring Estate. Places are limited on all tours. Registration is open until Thursday, 6 September 2018. Call +49 30 89786-5401 or email pr(at)deutsche-wohnen.com. 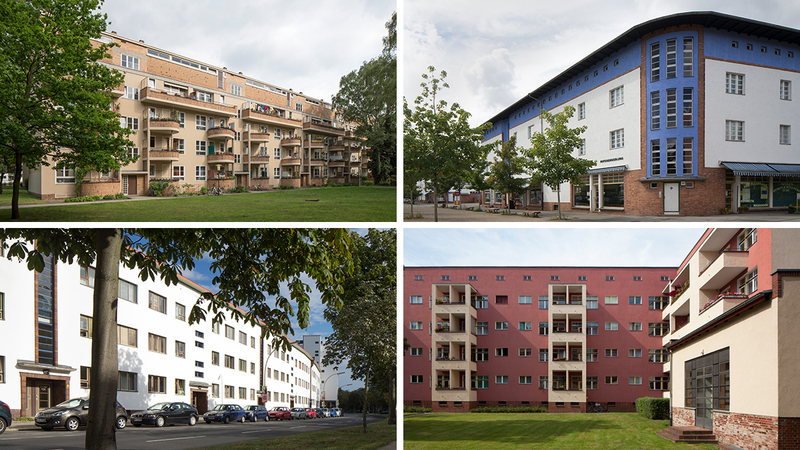 In close collaboration with the state of Berlin, Deutsche Wohnen is working to make the four estates of Berlin Modernism accessible to tourists and liveable for residents. The aim is to build a bridge between tradition, the present and the future. Built from 1925 to 1931 and based on designs by Bruno Taut and Martin Wagner, the estate combines ideas from the garden city movement and aspects of large-scale housing construction. This led to the creation of an estate which exemplifies the development of modern housing construction. You can find more information on the estate here. Tours will take place on Saturday and Sunday from 2 p.m. Meet at the Horseshoe Estate information station, Fritz-Reuter-Allee 44. The Weisse Stadt, also known as the Schweizer Viertel, was completed in 1931 and is the epitome of modern estate construction. The architects Wilhelm Büning, Bruno Ahrends and Otto Rudolf Salvisberg worked under the direction of city planner Martin Wagner; Ludwig Lesser designed the gardens. With its distinctive white colour, the estate was inspired by the Neue Sachlichkeit architectural style and is characterised by rationality and economy. A guide will take visitors through the estate on Saturday and Sunday from 1.30 p.m. Meet at the bridge building at Aroser Allee 154. The Carl Legien Estate in the north of the Prenzlauer Berg district is in line with the ideals of Neues Bauen. In contrast to tenements and dark courtyards, a workers’ settlement with bright, comfortable residential units and large, leafy inner courtyards was built between 1928 and 1930 under the direction of the architects Bruno Taut and Franz Hillinger. The free tour takes place on Saturday and Sunday from 4 p.m. Meet at Café Eckstern, Erich-Weinert-Strasse 101. The Siemensstadt Ring Estate was built between 1929 and 1934 with the participation of the architects Otto Bartning, Fred Forbát, Walter Gropius, Hugo Häring, Paul Rudolf Henning and Hans Scharoun, who all belonged to Der Ring – a progressive collective which had the aim of promoting Neues Bauen. The open spaces in Siemensstadt were intended to provide its residents with respite from the tough living and working conditions of that period. The tour of the Ring Estate begins on Saturday and Sunday at 10 a.m. at Jungfernheideweg 2, Siemensdamm U-Bahn station exit. Further information on the Berlin Modernist UNESCO World Heritage sites is available here.